I started working on this post a few weeks ago and don’t want to cancel it just because our Bali trip is postponed- I thought it might be super helpful still for those of you who have upcoming travel adventures! I plotted my carry-on for months in preparation for the 30 hours of travel we were facing. I’ve done enough epic plane flights to know that preparedness is EVERYTHING, and ill-preparedness can lead to absolute misery at 30,000 ft! So today I’m breaking down what goes on board the Boeings with me- from everything shown to a few other essentials that I don’t leave the country without. Hope you love! 1. This Mara Hoffman swimsuit was headed to Bali with me. 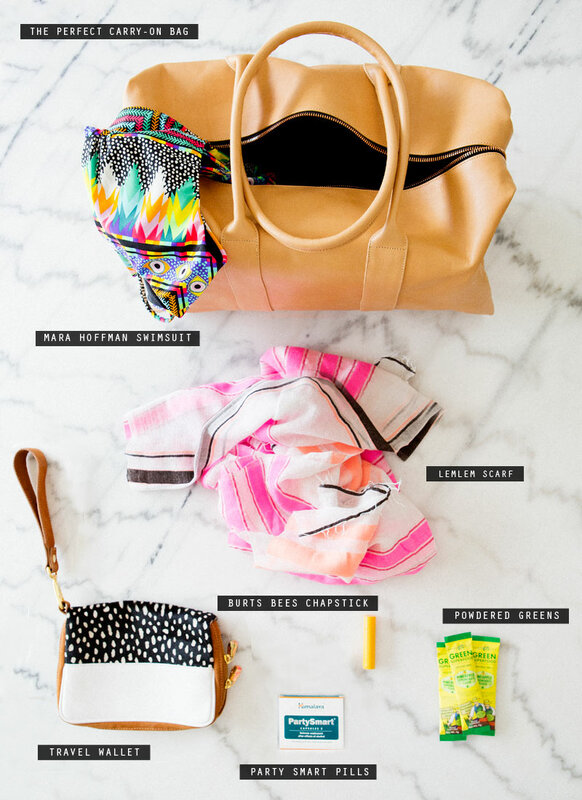 I always pack a swimsuit on my carry-on when traveling to beachy destinations because I don’t want to miss a beat should the airlines misplace my luggage! 2. A Lem Lem scarf that transitions to a sarong or blanket- the perfect weight to cover my head on a plane and or wrap around me if it gets chilly at my destination! 3. Burts Bees Chapstick- the minty flavor is so refreshing when things get dry on the plane! 4. Travel Wallet/Wristbag by Laael– if you’ve ever lost your passport, wallet, cash money, plane ticket or other important document while traveling you already know why this is so important! I love that this one has a wrist strap so I can have it all handy but attached to my arms while going through security and customs! It’s also adorable and perfect for wearing out and about once I’ve arrived at my destination. 5. Party Smart Pills– these are primarily to help support my liver once I arrive at my destination and start enjoying my poolside cocktails. Do they work? I HAVE NO IDEA! But they make me feel better about my cocktails and that counts for a lot. 6. Powdered Greens– I’m all about boosting my immune system on travel days and I’ve traveled to enough places where finding a green vegetable is impossible to know that I have to take whatever measures I can to get some nutrition in my body! These powdered greens are a lifesaver! 7. Travel size hand/body lotion– airplanes are so dry and made worse by the frequent hand-washings after bathroom trips so I always, always have a mini lotion in my carry-on! 8. Universal plug adapter– there’s no taking chances for me with checked baggage- the plug adapter comes on the plane with me so I can recharge during international layovers and as soon as I get my feet on the ground in my destination! 9. My favorite sunnies– Secret: I am one of those weirdos that sometimes wears sunnies in the airport. With my noise-canceling headphones. I basically look like a crazy person but I’m 1000X more comfortable than the bare eyed, non headphone wearing person beside me. The cat is out of the bag!! 10. Bose Noise-Canceling Headphones– THESE CHANGED MY LIFE. 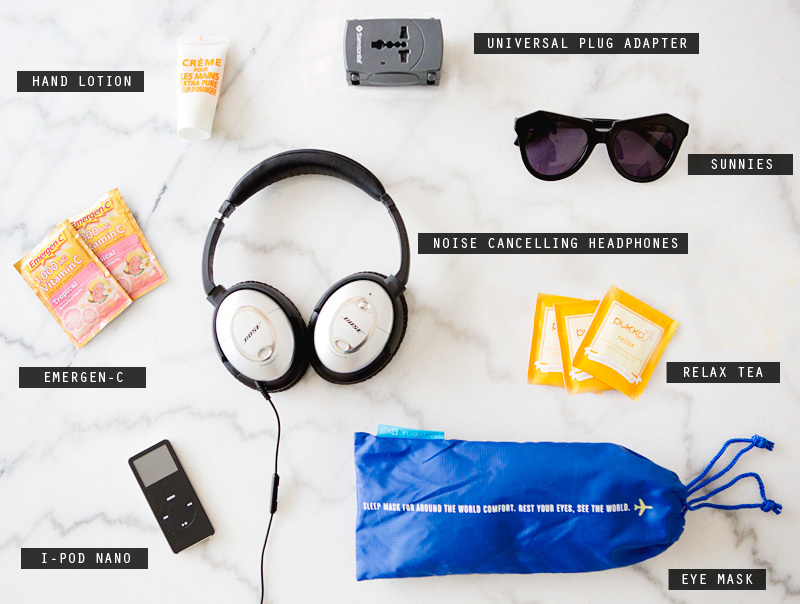 They’re seriously the single best thing I’ve bought when it comes to travel (and no, Bose did not pay me to write this but if they wanted to I’d take their dollas without batting an eyelash!) I never knew how exhausting listening to the noise of a plane, an aiport and all of the inhabitants is. UNTIL THESE. I know they’re a pretty penny but they are so insanely worth it. Lou wore them once and bought another pair at the airport to avoid ever traveling without them again. 11. Emergen-C– immune boosting, sweet flavored packets of goodness- these are a MUST! 12. Good ‘ol fashioned Ipod nano– music is so soothing to me when I travel, and in my noise canceling headphones I feel completely relaxed during the flight. And the softest music playing while the noise-canceling headphones are on puts me in my own world- one where I can fall asleep! 13. Relax Tea– this tastes like home to me, which is so welcome when I’m miles above and away. I never travel without my own tea bags to give me comfort and warmth on my flights! 14. My favorite eye mask – this eye mask comes with a little pouch that contains ear plugs (just in case there’s a baby on board that is unhappy about how things are going!). And they’re soft, fuzzy, and large enough to cover a big portion of my face. All wins for this lady! Not shown: I always pack some lightweight pajamas, this travel blanket/pillow that is EVERYTHING, cozy socks, snacks, a cell phone battery charger, a mini makeup bag, toothbrush/toothpaste, a crazy amount of water, Clare Vivier pouches for organizing everything and a sundress/pair of sandals for when I land! This couldn’t have come at a better time! Leaving for Europe in a week! Horray!!! Have so much fun in Europe! That little travel wallet is a total gem. I feel like you’ve got all the basics covered, but these days I feel like travelers need a straight up EXTRA CELL PHONE BATTERY! I always pass the time reading on my kindle app, which kills my phone. I also like to take a face moisturizer as airplane air makes my skin very dry and irritated. I love the wristbag and its black & white color pattern. Cute – the scarf is absolutely essential for me – as well as warm socks! i leave for turkey on friday, thank you for this list! green powder packs and a travel pillow are now on my list too! – evian or avene facial spray. you never realize how dry the air is until you try it. must have on planes. – a good make up remover wipes. – spare glasses if you wear contacts and remove contacts if it’s long flight. One thing that I have changed to is a very small roller bag instead of a tote. As I am now in my 50’s carrying all that stuff just makes my shoulders hurt! The trick was finding a small yet stylish roller bag that really does fit under the seat. Why oh why is it so hard for luggage companies to come up with stylish and classic looks in small roller bags?!? I can then attach that bag to my other carry-on which I check so I have only one handle to grab and roll. I also have a small, lightweight (and stylish) backpack for a purse. Lightweight is also another bug-a-boo of mine. When you are traveling who wants to carry all that weight for hours whilst site-seeing? I have gone for 3 weeks to Australia like this and am heading to Italy like this. Here is another travel wish…nice stylish clothing and comfortable stylish walking shoes for traveling (when walking for many, many hours for several days you really can’t do this in high heels as much as one might wish) . I’ve spent the past year gathering items that don’t look “touristy and dumpy”. I wish I had the energy to start a company that has all the things I want for travel. Great post! Next one, travel play list. I love to listen to podcasts when I fly! I just close my eyes, listen and time…flies! I think you’ve got everything covered here. I guess I’ll be putting the same in my carry-on tomorrow. 🙂 Although, I’m bringing my camera battery chargers in my carry-on as well, there’s no way I would leave those in my checked luggage. Such great tips!! I need them all for my upcoming trips! Powder greens and party pills… a revelation! I never thought of taking my own tea bags for travel. That is seriously so genius though. I always hate the options on flights! 3. Small water bottle for the flight crew to fill up in case I get thirsty between cabin services. That travel bag is everything! Functional and stylish! Well worth the investment! i love that carry on bag! i’m going abroad in august and have been on the hunt for one! do you have any other recommendations that maybe aren’t quite as pricey (around 250 or 300 dollars)? I’ve been having a tough time finding a cute carry on! This looks pretty similar to my carry on, but I always have an extra 4 or so magazines I’ve been meaning to read. Thank you for this list Sarah! SO glad to hear about the Bose headphones. It’s been a fruitless hunt for a tried-and-true pair. I fly next week and am inspired to pack my carry-on now! I love the headphones! So nice that they can be cordless. Game changer when it comes to travel. Love these tips- such a beautiful post! My hubby and I going to Switzerland this year and I am def snatching up that OMG bag! It’s beautiful!